On the ground in Africa, international charities and aid organisations do vital work in helping the victims of disasters, or pursuing longer-term projects to improve services or to build the skills and capabilities of communities. None of this should stop. But the prominence of this work in our consciousness and a single-minded media focus on images of famine, drought and conflict has done Africans a disservice. They have reinforced the idea of a continent of dependency, of victims and of helplessness, where the normal rules of economic life are suspended. This perspective was encapsulated by the 'Economist' front-cover which, in 2000, dismissed Africa as 'The Hopeless Continent'. I have been lucky that during my career, I have often found myself involved in Africa as either a place in which to invest – especially in the resources sector – or on a policy level. I have long believed that Africa has too often been treated as if its people should be treated as a charity-case rather than as a vibrant place, full of able people, in which to invest and do business. I have been involved in a number of initiatives designed to improve governance or perceptions of Africa, such as the Extractive Industries Transparency Initiative which is now being implemented by 17 African countries; or the Investment Climate Facility for Africa; or, at the time of the last British Chairmanship of the G8 as the first Chair of Business Action for Africa. The governance and politics remain a challenge in many countries, but as a long-term observer of African affairs, I feel that things just might be different this time. The odds are pretty evenly balanced. 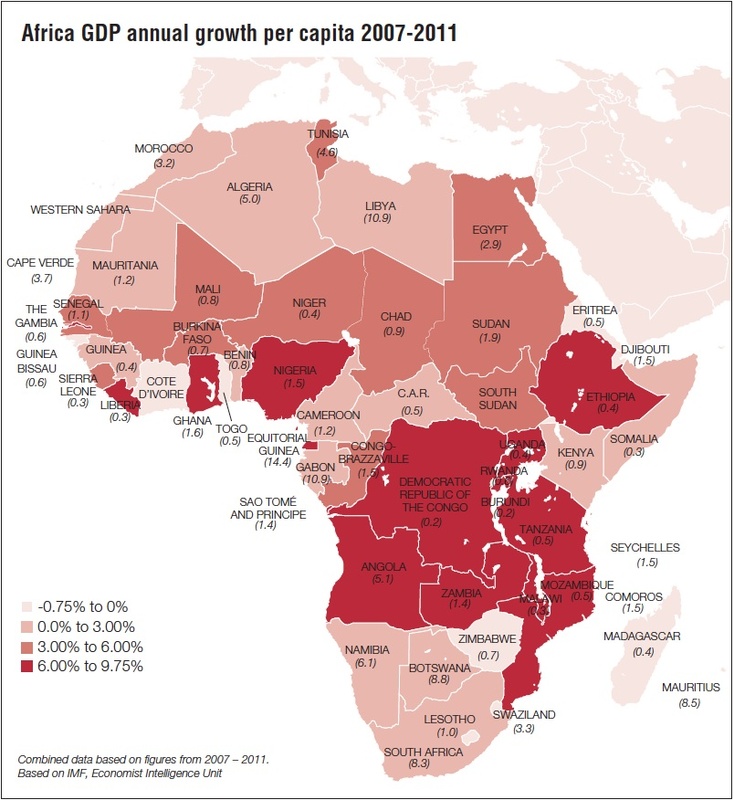 In the last 12 years, Africa has done relatively well. The Economist has recanted and 'Time' magazine has recently trumpeted 'Africa Rising' across its cover. A recent prediction from emerging markets specialist Renaissance Capital suggests that Sub-Saharan Africa's GDP will surge from its current paltry $2 trillion to $ 29 trillion by 2050; and South Africa's Standard Bank (now 20% Chinese owned) predicts that Africa will move from accounting for 2% of global GDP to 5% by 2030. So are the winds of globalisation about to fill Africa's sails or has the pendulum of punditry swung too far from pessimism to optimism? The answer is that Africa is probably a lot better than many people in the West assume; that it is better than it was; that it has the makings of something a lot better; but that the African Renaissance declared by President Thabo Mbeki remains patchy and fragile. This, rightly, reminds me to enter a health warning. Sub-Saharan Africa consists of almost 50 countries; their stories are very different. Per capita income ranges, for example, from Equatorial Guinea with $15,000 to Burundi with $200. For investors a key test is to pick the winners. So what has been going right for Africa? A decade ago, parts of the continent were badly hit by HIV, malaria and TB. All three remain serious challenges but, helped by international support, the corner has been turned. Child mortality has fallen by 30% in twenty years. Poverty levels are falling by more than 1% a year. Urbanisation, currently standing at 41% is increasing rapidly, which may not be good for political leaders concerned about concentrations of disaffected youths, but bodes well for economic take-off. Africa's embrace of the mobile phone – Africans have 750 million handsets – has enabled them to play technology leapfrog and to lead the world in areas like Kenya's M-Pesa payments system. A significant middle class is emerging and African consumers spend more, on average, than Indians. And Africa boasts six of the world's ten fastest growing economies of the last decade – and in only three of them have natural resources been a decisive factor. In the political realm, over 50% of African countries now hold credible elections'. Smaller countries (whether by population or land mass), perhaps because of their greater homogeneity, like Mauritius, Botswana and Cape Verde, tend to be more successful democracies. Ghana has seen two peaceful changes of government in the last twelve years; Zambia and Senegal have changed governing party this year. Liberia and Sierra Leone which, a decade ago, were in ruins, have recently re-elected their Presidents in fair contests and Guinea, Cote d'Ivoire and Niger have come back from conflicts and coups to hold successful Presidential elections. But most African countries are still hybrid democracies and the nature of democracy in many of those where power does change hands veers towards a 'winner takes all' model. Freedom House suggests that the number of democracies may even have fallen slightly from 21 to 19 since 2000. Certainly corruption is often endemic, government capacities are low – which may not be surprising when only 5% of Africans attend university and when 50% of those who graduate in Ghana leave the country – and poor governance remains common. But at least the holding of elections is increasingly an expectation in most countries and civil society groups are becoming more assertive and better resourced. The post-Cold War rash of African civil wars has been quelled but violence still flares in the east of the Democratic Republic of Congo and Sudan. The situation in the Sahel, and especially Mali, looks increasingly ugly. 33 countries globally carry the designation 'fragile states': 20 are in Africa. Economically, Africa has weathered the economic storms of the last five years pretty well. This year the continent is expected to turn in an average growth rate of 4.8% or over 6% if a sluggish, but still economically dominant, South Africa is excluded. Private capital flows overtook aid in 2006 and are now twice as big. Zambia, Ghana, Senegal, Nigeria and Namibia are all successfully tapping global bond markets. In 2009, Rwanda was lauded by the World Bank as the world's top reformer in the field of improving its investment climate and in 2011 seventeen of the top fifty reformers in the Bank's 'Doing Business' survey were African countries. However, before breaking out the champagne, it is worth recalling that thirty of the worst fifty performers are also African. Africans certainly do not lack entrepreneurial spirit but in many countries the regulatory burdens that go with operating in the formal sector are a disincentive to the growth of businesses. Over half of Africa's trade is now South-South, including with eager partners in China, India and Brazil – even though there is still far too little inter-African trade. The continent offers amongst the highest investment returns, although a cynic might regard this as a requirement given the perceived levels of political risk. Africa is generating home-grown multinational companies. Africa has huge potential to raise agricultural productivity and to become a significant net exporter of food – one third of the world's uncultivated tillable land is in Africa. Ethiopia, closely associated through Live Aid with famine, is now the world's tenth biggest exporter of livestock. Manufacturing, however, remains in the doldrums and only accounts for the same percentage of GDP as it did in the 1970s. However, South Africa possesses some world-class manufacturing and there are signs of Chinese investment in the sector as their domestic labour costs rise. It is worth looking more closely at two factors in Africa's strong economic performance – minerals and China. There is nothing new in the idea of Africa as a big exporter of commodities. But the US's desire to diversify its oil and gas suppliers, increasing strategic competition for assets from China and higher commodity prices have fuelled a boom. 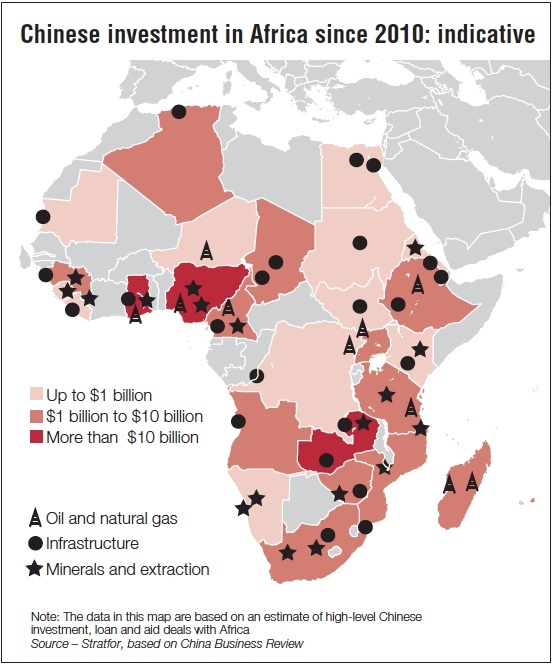 For eighteen African sub-Saharan countries oil, gas or mining makes up more than 5% of their economy. Oil accounts for 62% of the Republic of Congo's GDP and mining for 54% of Mauritania's. Kenya, Uganda and Ghana are set to become significant oil producers; Tanzania and Mozambique are predicted to generate $2 billion and $10 billion respectively for government coffers annually by 2020 from natural gas; and Guinea and Sierra Leone have the potential to become big iron ore producers and Mozambique to become one of the world's leading coal miners. 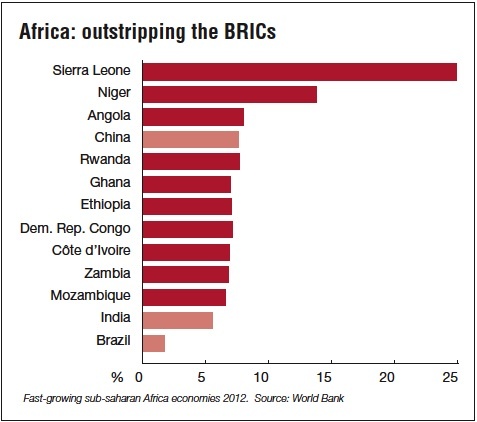 'Ah, but...' you may say, 'this just shows that Africa's thrusting economic statistics are built on sand.' But it ain't necessarily so. Some of the thrusters – like Ethiopia and Rwanda - are not resource-rich. For those that are, a recent publication by the Africa division of the World Bank performed the last rites on the dominant 'resource curse' narrative1 , declaring that: 'recent work, embodying better data and methodology suggests that there is little evidence to support the notion of a resource curse.. the evidence points to heterogeneity in countries' growth performance; some resource rich countries perform poorly compared to non-resource rich countries, others do not'. The difference lies, at least in part, with governance and how the resource wealth is used. Africa needs more Botswanas; a country whose success has been built on their enlightened development of diamonds and a longterm partnership with De Beers. The benefits of that partnership have increasingly tilted towards Botswana, most recently after De Beers transferred its diamond sorting activities from London to Gaborone. Enlightened behaviour by big resource companies has a part to play in supporting transparency, through partnerships like the Extractive Industries Transparency Initiative, in capacity building and in creating greater linkages between their operations and their host economies. I have seen EITI beginning to have a real impact on the level of trust and understanding about the economic contribution made by the oil, gas and mining sectors – and, especially in Africa, it is leading to increasing questioning of governments about how they are spending the revenues. Investment has poured into the resources sector. Meanwhile, emboldened by 'super-cycle' rhetoric, suggesting that high commodity prices are here to stay, and by Chinese competition for resources, a number of producer countries have drunk deeply from the cup of 'resource nationalism'. Big hikes in taxes and royalties, unstable regulatory regimes and demands for free carry or subsidised State or indigenous equity stakes, threaten to break the momentum. Guinea has been an example of this phenomenon and has recently seen BHP Billiton and Vale disengage from or suspend projects in the country as they cut back their global capital budgets. Despite its continuing potential, South Africa has performed poorly in attracting mining investors, scared not by the need to address the legacies of apartheid, but by the way in which this has been done with too narrow a base of black beneficiaries and too complex and intrusive a matrix of regulatory goals. Africa is by no means the only place to have experienced this surge of 'resource nationalism' but it is potentially more vulnerable than other regions, like Latin America, because investors start with a more wary attitude. Africa has huge mineral potential and stands to profit greatly as big projects reach payback and move in to revenue generating mode, but some countries need to beware of killing the goose before it lays the golden egg. It is also important to ensure that as and when commodity prices come off, with knock-on effects for government revenues, that yawning fiscal deficits don't open up. And so to China. Sino-African trade has risen tenfold since 2000. China is now the continent's biggest trading partner and Africa is virtually unique in enjoying a surplus. True, the exports are overwhelmingly of resources but the economic links are multiplying fast. Between 2005 and 2010, the Chinese invested $44 billion in Africa. Soft loans and opaque resources-for-infrastructure barter deals, coupled with its record of project delivery, have given China dominance of infrastructure construction: roads, railways, power plants and a new headquarters for the African Union. The construction boom is without parallel in Africa. China's own model for lifting hundreds of millions out of poverty was based on market reforms, a 'build it and they will come' infrastructure development programme and special economic zones. And, on cue, the Chinese have established five Economic, Trade and Co-operation Zones in Africa – in Nigeria, Zambia, Egypt, Ethiopia and Mauritius. Many Africans see attractions and potential in this alternative development model which is based on the pursuit of hard-edged mutual economic interests with less conditionality and Western 'finger-wagging'. Points of friction from China's surge in the region include: the import of Chinese labour to work on construction projects in a continent beset by unemployment; increasing imports of Chinese manufactures; clashes over alleged disregard for labour rights in Zambia; and the emergence of unlicensed Chinese artisanal miners in Ghana. Of greater concern is the risk that the pressures for improved governance that in recent years has sprung from African citizens and civil society groups, reinforced by Western donors, extra-territorial legislation against bribery and multinationals constrained by CSR principles and the need for public reporting on their activities may be undermined by Chinese enterprises unafraid, as I remember one senior Chinese executive describing it to me, to 'swim in murky waters'. But for all these concerns, China's investment and trade have undeniably added a new dynamism to Africa's growth story. So, is the African glass half empty or half full? The signals are not all one way. Forthcoming milestones include how South Africa's ANC emerges from its leadership struggle; whether collective action can dislodge Al Qaeda from northern Mali – without simply displacing the problem in to the rest of the Sahel; whether the DRC can be stabilised; and how Kenya and Zimbabwe emerge from their stand-off coalition governments. The political picture is, at best, mixed but there are some democratic successes. Nevertheless, if the economic momentum can be maintained, some of the infrastructure bottlenecks unblocked and the wealth generated spread, then life may be on an upward trajectory for millions of Africans. Connecting Africa more fully to the opportunities of globalisation would be a real advance. Perhaps we have to get the economics right and hope that the politics will follow. For now, the glass looks at least half-full. Edward Bickham was Executive Vice-President for External Affairs of Anglo American plc (2000-2009) and Special Adviser to the Foreign Secretary (1990-93). He now advises companies on license to operate issues, primarily in the extractive sector.